I have been reading “Jupiter’s Travels” by Ted Simon for a week or so, and it is really good. 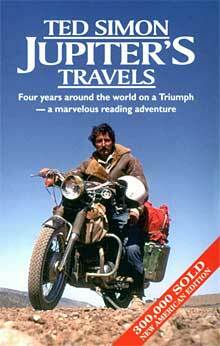 It’s about a round-the-world trip that Ted Simon took upon his Triumph motorcycle back in the 70’s. He balances the technical motorcycle aspect with the travel aspect perfectly (to me, at least), and the pacing is nice and fast. I read that Simon is attempting the same trip by motorcycle again, and I can’t wait to read about the modern-day journey. It will be interesting to get his perspective on how the world has changed.